Here’s the first and larger part of our Christmas shopping for this year’s festivities. Christmas is extremely important to me and decorating our home accordingly is a given. So what did I get from Ikea? From the top left you can see a lovely red blanket (to go with the Christmas cushions I got for the sofa), adorable candle lanterns, two bottles to serve as wine decanters at our Christmas dinner party, numbered advent candles with a tray for them to stand in, red napkins for the dinner party, red flower pots for Christmas stars (Poinsettias), a five-pack of red pillar candles, different kinds of wrapping paper and ribbons, two scented candles (my favorite, they’ve got an icecreamy scent, yum! 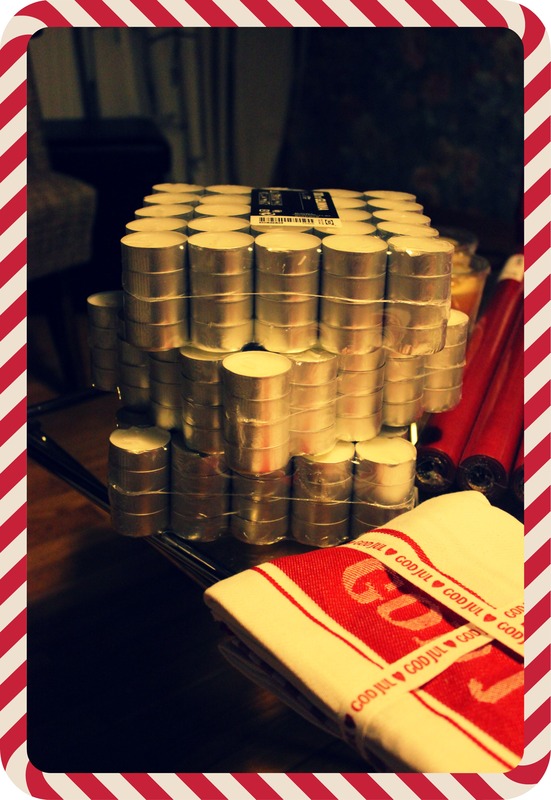 ), a box of pretty glass Christmas tree ornaments (hidden behind the huge stack of tealights), a huge stack of tealights, ribbons for hanging Christmas ornaments and molds for truffle making. These should get me through December! 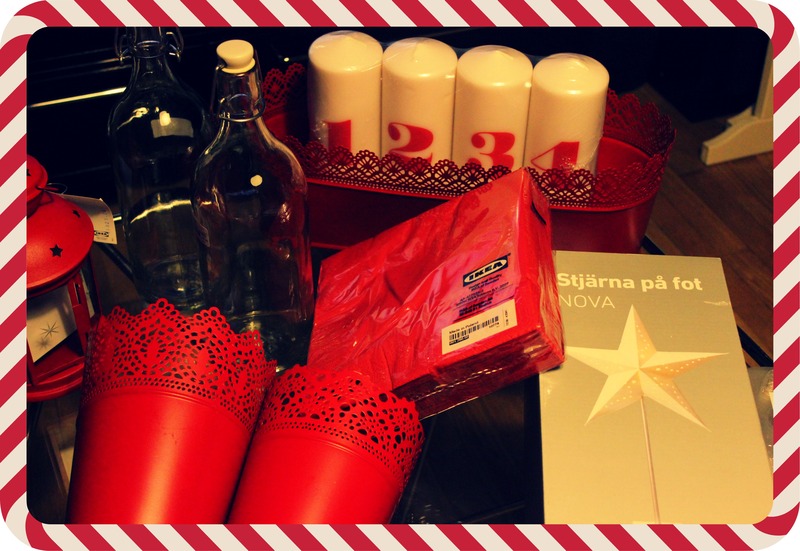 Advent candles, flower pots, bottles, napkins and a star-shaped lamp for our kitchen window. We’ve already got four sets of Christmas lights, but one can NEVER have enough! The bottom one is a net of lights for the Christmas tree (will sure be fun to unravel after taking it down every year) and the top one is for lighting up a wreath I plan to make for the window in Ladybug’s room. 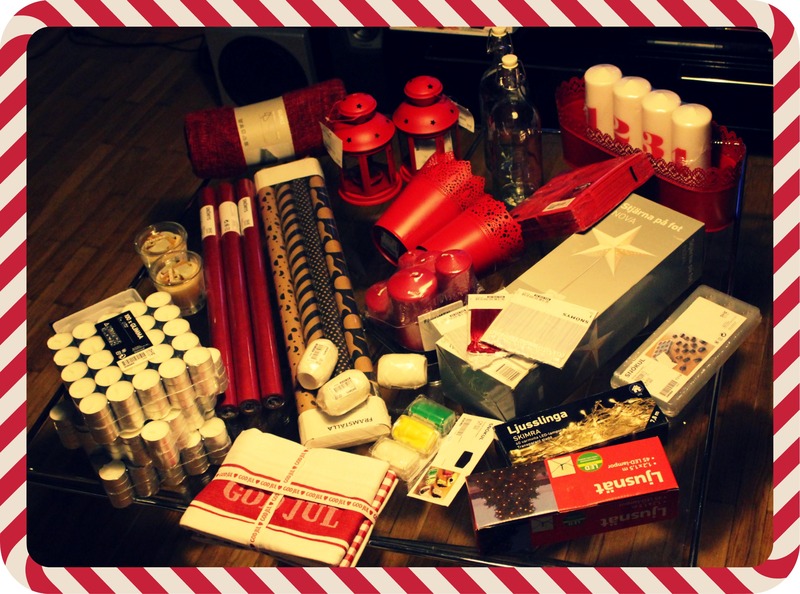 Are you excited to see what else I got from IKEA and more of our Christmas shopping from H&M Home?